What if you create $? Not the federal reserve. Future? Over the years, money has revolutionized from the barter system to gold/silver coins to paper notes to currencies which we use today. Everything looks fine now! A proper government, proper money creation, online transaction. Right? Or is it?! Every step of money conversion leads to the more efficient, easy to use and less corruptive form of money. So, what are the problems we have in today's money? To answer that question let’s get to — how is the money being made today? We’ll take the example of USD here and how federal reserve creates it? How Federal Reserve Creates USD? Till 15 August 1971, USD was backed by gold. So whenever Federal reserve creates USD they’ve to deposit more gold as the collateral. After President Nixon announced USD won’t be backed by anything anymore. This gave Federal Reserve power to mint and burn USD whenever they want according to the economy but where does this money get its value? It’s not backed by anything, confusing, huh? For a detailed understanding of how federal reserve creates and burns USD refer to this article. How the RBI (Reserve Bank of India) creates INR? Previously, just like how USD was backed by gold, INR is backed by USD. So Whenever RBI creates INR they’ve to keep the equivalent value of USD as collateral. Though the process of creating money today is comparatively better than other alternatives but with some new problems. Let’s discuss that. Normal people don’t know the supply of total USD or any currency. Even the Federal Reserve doesn’t know the total supply. They just assume. This whole process is not transparent to a sufficient level. When the money is created? Where do they transfer it? When did they burn it? etc. Only the government has access to decide the whole economy of the country. People don’t have a say in it. It looks like a normal problem, but this thing affects the whole economy of the country. You don’t know if a large portion of it is going into corruption. 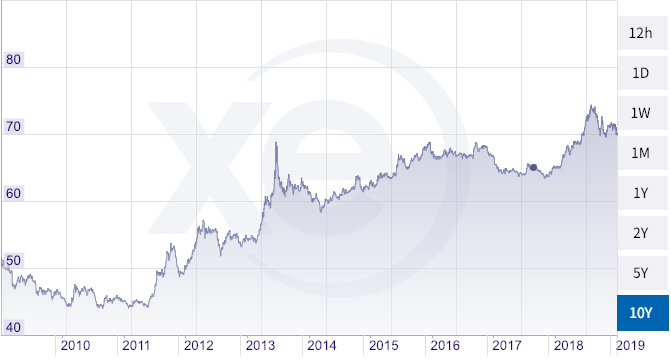 In 10 years, the INR went from 50 per USD to 70 per USD. What if you can create the money, not the government? But how and what are the advantages? Remember Federal Reserve used to keep gold as collateral to create USD. What if you can keep your gold (or any asset) as collateral to create currency? Just like you do at the time of taking the loan. You deposit your asset and get the loan from the bank in the normal currency but this time there’s no bank and you’ll create $ out of thin air. What if I say you can do this at the end of this article? What? When? How? Why? I can see many questions popping in your head. Let’s dive in. Let’s start with the question of “how”. How will anyone be able to create $ without the involvement of Federal Reserve itself? Heard of blockchain? Nope? Then, Bitcoin? Nope? Then I’ll prefer getting basic knowledge about blockchain by basic google search and by reading this article. The blockchain is the underlying technology of bitcoin. Bitcoin is a small use case of the blockchain, to be precise it’s “👌” much. Blockchain has many use case just like the internet. We’ll get more into ethereum blockchain. So let’s get back into solving our main problem of “how to create $”. Do you know you can buy gold on Ethereum Blockchain? Yeah! Real gold, check out — Digix (DGX). But, in this article, we’ll focus on ETH (Ethereum) as asset/collateral to deposit and to create $(DAI). Now, what’s special on ethereum blockchain. Anyone can create the smart contract, it’s a piece of code which is deployed on the blockchain, so it’s immutable and will do exactly as it says. Imagine a smart contract, which does all the things I mentioned above, from depositing ETH to get the loan in a stable coin which is equivalent to $1 and the loan you’ll get will be newly made coins, they will get minted out of thin air and when you pay the loan it burned out of existence. This will give everyone the power to take a loan by depositing their asset without the need of a bank, creating currencies without the need of government and enabling the whole new era of giving the power of government (centralized organization) to every person globally. I’ve not gone into too many technical details assuming many of the readers are a noob to blockchain but curious people can always check — MakerDAO. When would we possibly be able to do this (create currency)? What if I say now? I minted around $715(DAI) by locking 12 ETH as collateral on InstaDApp, myself. Now, I’ve spent all the $715 and I’ve no idea who has my money and now whenever I want my collateral back I just have to pay my debt with the interest that’s all no government, no banks. Anyone with the ETH can create DAI without any permission. In the near future, you’ll be able to take create DAI via gold (DGX), bitcoin (WBTC) and many other assets. 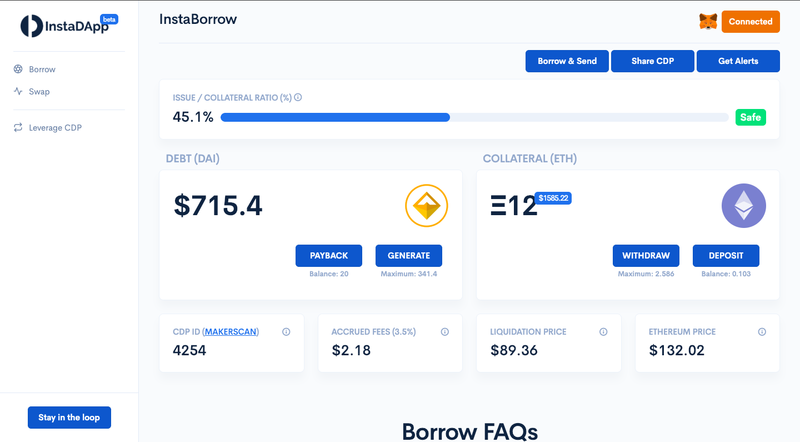 As of 12 Mar ‘19, the total DAI that has been created is “92,429,142.7301” backed by 2,165,005.44 ETH as collateral at $131.45/ETH and it’s growing exponentially. For real time stats check out — MakerScan. What are all the platforms where we can create DAI? This is the first article in the series of how blockchain is changing our day to day life. Creating $ is one of many good uses of blockchain there are a lot of great projects which are already shaping our future. Subscribe our publication and follow us on Twitter for future updates. Till then explore blockchain!! 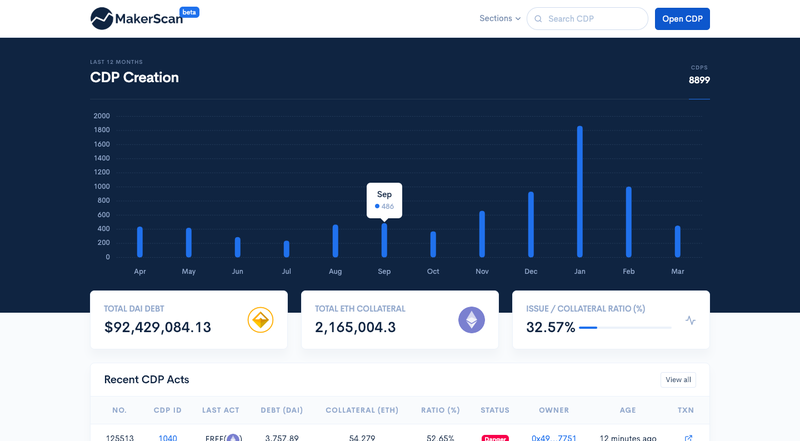 InstaDApp is a Decentralized Bank built on top of the MakerDAO protocol, making it easy for everyone to interact with the blockchain, especially while taking loans. The team always looks forward to simplifying the experience for non-technical and non-financial users.